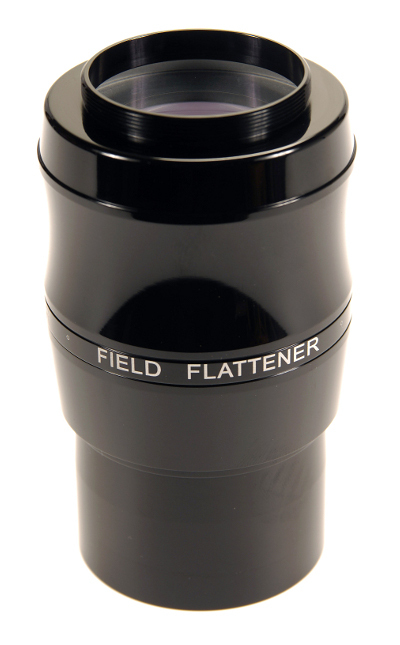 Superb quality, non-focal reducing Field Flattener optimised for DSLR imaging on refractor telescopes with focal ratios of between f/5.5 to f6.0. Will also provide much improved results on refractors with focal lengths narrowly outside this optimised f/range. Integral T-Ring adaptor thread. High quality CNC machined body with gloss black anodised finish. I bought this shortly after my Equinox 80 Apo refractor. Although the Equinox is slightly over F/6, this flattener works a treat with it. My images are crisp, flat and sharp right to the edge. Before, I had a few defects on images at the edge of the field which I just could not correct. It screws directly onto a T-mount so no need to mess around with adaptors which can upset focus, the other end is threaded to accept 2" filters. Short tube refractors and this flattener go hand in hand, it gives so much improvement to deep sky images when you want to use the whole of the image and don't want to crop. Fantastic flattener and doesn't break the bank, well impressed! 17 of 17 people found this review helpful.